Too bad it's just a dream. Sorcerer Mickey Mouse looks mighty confident, commanding the planets in a colorful robe and jaunty hat. Too bad it's just a dream. 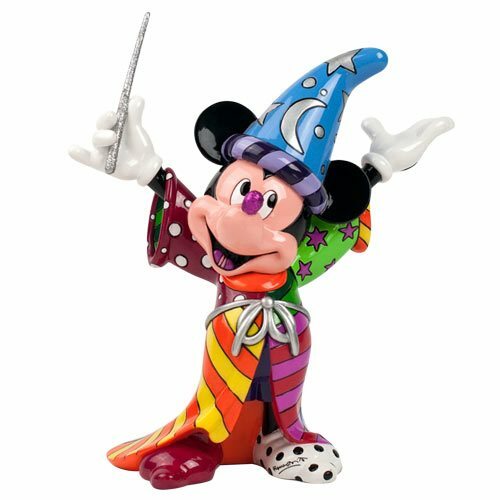 Fortunately, this handcrafted 9 1/10-inch tall Disney Fantasia Sorcerer Mickey Mouse Statue by Romero Britto isn't! Sculpted from stone resin, the beloved character's exultant figure is hand painted and finished with a glossy top coat for a brilliant sheen. Let Mickey bring a little magic into your home!